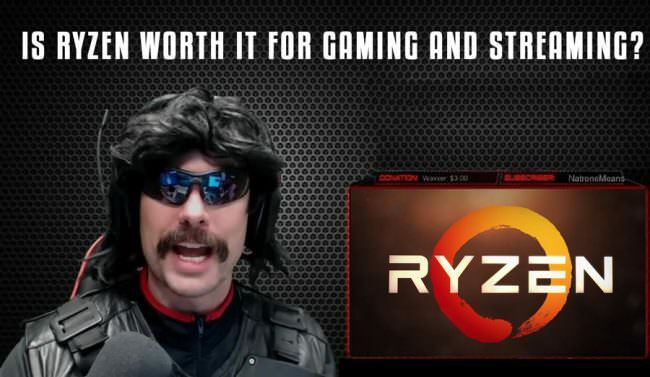 Is a Ryzen Gaming Streaming PC worth it? Obviously being an Intel fanboy I was looking at getting one of the Skylake or Kabylake CPU’s. But AMD Ryzen series caught my eye after building a Ryzen 5 1500 budget PC for a friend down the street. So I did the research and want to save you the time and hassle of doing all the research I have done and gather all my findings and thoughts into this short blog post. At this point I have watched a ton of YouTube videos. Read a lot of first hand accounts, from Reddit, and Tom’s Hardware. The consensus from a lot of the benchmarks for gaming have Intel being more superior single core power as expected. Even though Intel is the more powerful CPU, AMD still holds it’s ground either being slightly behind Intel in FPS or sometimes even beating it out. IT IS ALL SITUATIONAL STATS and I want to say that stats are way to close to even care about. Intel will beat out AMD in some situations and AMD will beat out Intel in other situations. This made me want to save some money and and consider getting the AMD chip. Plus the AMD chips will be more superior in multi tasking which is what I am shooting for in my next build. Theoretically all the extra cores and threads will make it easier for a Ryzen build to stream and game without too much strain on the CPU and dropped frames while using a streaming app like OBS. Obviously I can’t personally attest to the capabilities of Ryzen streaming and gaming capabilities yet, since I don’t have the PC at the moment. But luckily we have many YouTube videos of people running the benchmarks for us. Here are a few videos for you to watch and decide for yourself. In this video Linus Tech Tips Compares a few CPU’s with their streaming gaming capabilities. Make note that he is using all the top of the line hardware. But as you will see in the video that Ryzen encodes and plays games very well and had them come out on top for most statistics. Personally I decided to go non-x and overclock the regular 1600 chip. But if you don’t intend on overclocking then maybe you would want to consider the X chip for the slightly faster stock clocks. Is a Ryzen Gaming Build for me? All prices are dated from the post now and are from Amazon and Newegg, you may be able to find slight deals here and there. Case: I am choosing from Micro-Atx cases, which is why I went with a Micro-ATX gaming board. Now cases will be personal preference but the cases that I am considering are. The Cooler Master MasterBox Lite 3.1 Or the Panteks Enthoo EVolv for their sleek designs. Now maybe you don’t have the same taste as me, then no problem their are so many cases out there on Newegg, Amazon or Wherever you find your deals online or in-store. PSU: For the power supply I like to go fully modular for maximum cable management. I rarely look at the rating of the PSU such as bronze, titanium, Platinum or gold. I usually just look at the price and if it is fully modular. We can debate it out till we all die, but whatever this SeaSonic M12II will do. Yes, Ryzen is great for gaming and streaming it handles the workload of a CPU intensive game and the encoding of a stream without a hitch and is totally worth it. Ryzen is less powerful than Intel as per usual, but the mid range Ryzen 5 series is great for the price and can compete with an i7 7700k. But just because Intel is the most powerful doesn’t mean the AMD is weak if they are only a few steps behind in terms of power. If you are looking for max frames and not streaming on the same PC then Intel may be the way to go. I personally have decided to go AMD this time around as it will be more of a workhorse PC for me with streaming and video editing. Also, I believe that coming from the i5 2500k that the build I put together will do what I want and more for the next 5 years. You can follow our twitch at Geektak and hopefully it will be in action shortly.